With its “Se” series of enterprise hard drives, WD is targeting those in need of “bulk storage”, whether it be in a datacenter or NAS. Its biggest perk is that it almost perfectly mimics the company’s Re drives, boasting a 5-year warranty, models ranging from 2 – 4TB, and best of all, a price tag of up to $80 less. Last summer, WD released its first-ever hard drive series dedicated to NAS use, called Red. These drives target users who require both large storage and high reliability under a RAID setup, but don’t necessarily need top performance (though, as we discovered, the Reds do perform quite well). Since the series’ release, it seems the drives hit their mark; many NAS users I know have already implemented them into their setups. With Red, the SOHO and SMB markets are covered – but what about a similar option for the enterprise? As this article has no doubt given away, that void has just been filled. Introducing WD’s Se enterprise series. The target market for Se is “bulk” storage: high-end NAS and “scale-out” architectures (where storage is added over time). As we’ll discuss later, Se drives can serve the SOHO / SMB user as well, but that’s not WD’s main focus given the existence of the Red series. However, as Red doesn’t feature a 4TB model, nor offers enterprise-level features, some could find Se to be a more attractive option. Se becomes the third entry to slot into WD’s current enterprise lineup, sitting underneath Re, a “durable” option, and Xe, a “performance” one. WD considers the Se to be “scalable”, as its main job is to hold lots of data and remain reliable for those who don’t have incredible throughput requirements. Using a tier system to help explain the exact target for the Se drive, WD puts both Se and Re in the same tier 2 level, with Xe occupying tier 1. Interestingly, the company teases both a tier 0 (“future SSD”) and tier 3 (“future HDD”). The lower the tier number, the higher the performance, the greater the cost, and the smaller the storage. If I had to guess, tier 3 will end up being WD’s first ~5300 RPM 4TB+ series for mass-storage environments with a cloud focus. Like the Re series, Se features support for TLER, StableTrac, RAFF and other enterprise-level features, some of which we’ll talk about shortly. None of WD’s desktop drives include these features – not even Red. Performance-wise, Se drives align quite well with Re, although Re is better designed to handle a greater annual workload (550TB/year vs. 180TB/year). Also, while Se looks to be the “Red of the enterprise”, it carries a full 5-year warranty – don’t mistake this as a “budget” series. All drives are available in SATA 6Gbit/s flavors with 64MB of cache. Pricing is based on stable trends across two major etailers. 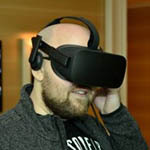 At its initial price-point of $310 (USD), the Se 4TB costs $80 less than an equal density Re model, and given the primary difference between the two revolves around total throughput, that cost-savings is undoubtedly going to be attractive to those who simply need lots of reliable storage. 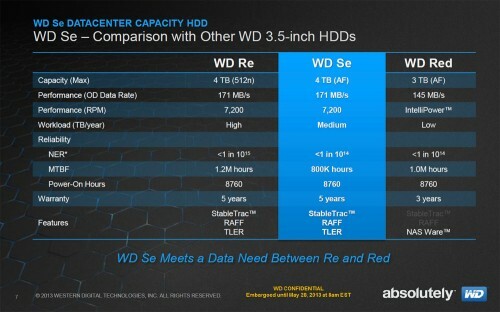 With the help of the slide below, we can get a much clearer idea of what WD expects its users to do with its Re and Se drives. While both carry almost identical specs overall, the primary difference is that the Re drives are designed to handle 3x the total annual throughput (mentioned in another slide). Also, its mean-time before failure (MTBF) rating has been decreased from 1.4 million hours to 800,000. To the Se’s favor, its peak power draw has seen a decrease from 10.4W to 9.5W, versus the Re. This might mean little for a home or small office, but to WD’s target “bulk” market, it could mean the difference of thousands of dollars wasted on energy costs annually (we’re talking about mass storage @ 24/7, after all). So to reiterate: the main difference between Se and Re is that the latter is more durable, spec’d to handle 3x as much data throughput over its lifetime. On the next page, we’ll take a look at the reasoning behind the Se series, as well as explain its enterprise features.